Looking to make your lips shimmer and shine this holiday season with all of the love of a natural, moisture intense lip balm? 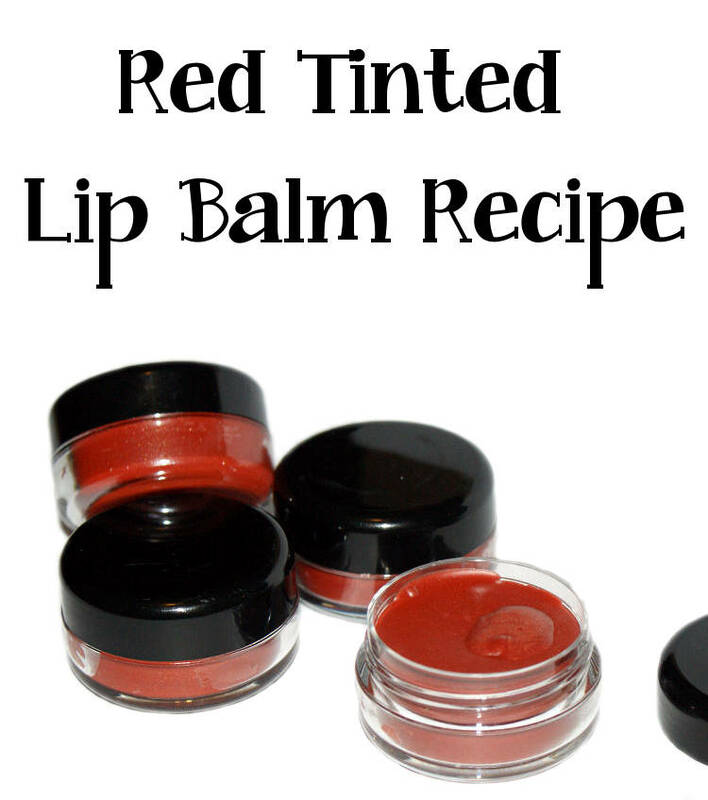 Then try your hand at this easy to create perfect pout red tinted lip balm recipe! The deep red with just a hint of shimmer glides on lips and looks natural while giving lips a bit of color oomph for that perfect holiday smile. Plus they are perfect as homemade stocking stuffer gift ideas. Using a digital kitchen scale weigh out the beeswax and cocoa butter into a glass Pyrex measuring cup. Heat in microwave at 70% power until almost completely melted. Next weigh out the shea butter and coconut oil and add to the beeswax and cocoa butter. Continue heating until all ingredients are thoroughly melted. Now weigh out the sweet almond oil, macadamia nut oil and vitamin E oil and stir into the mixture. Using a different plastic transfer pipette (if you don’t have a dropper on your essential oils) add the glycerin and the peppermint, lavender and tea tree essential oils to the lip balm base. Finally add the red oxide and mica. Use a stick blender to thoroughly incorporate the color into the lip balm. Now pour into your desired containers and allow to solidify. This recipe will fill approximately ten lip balm tubes or about five 1/3 oz. (10 gram) lip balm pots. For more DIY beauty recipes, homemade soap recipes and more, be sure to follow my boards on Pinterest. I am a bit concerned about the “red iron oxide pigment powder” – what I found online was that this is for external use only, so I am not sure whether it is a good idea to mix into a lip balm… Otherwise the recipe is great! Thanks for sharing! Red iron oxide is a common natural pigment found in many cosmetics. It is safe for and approved for use on lips as well as eyes and other general cosmetics. Hope this helps. Do you have an alternative recommendation for the Earthen Mist Mica? That site requires a $100 minimum purchase, but we only need as pinch. Thanks!!! You can sub with a bronze mica from somewhere else that’s similar. I just happened to use that specific mica.